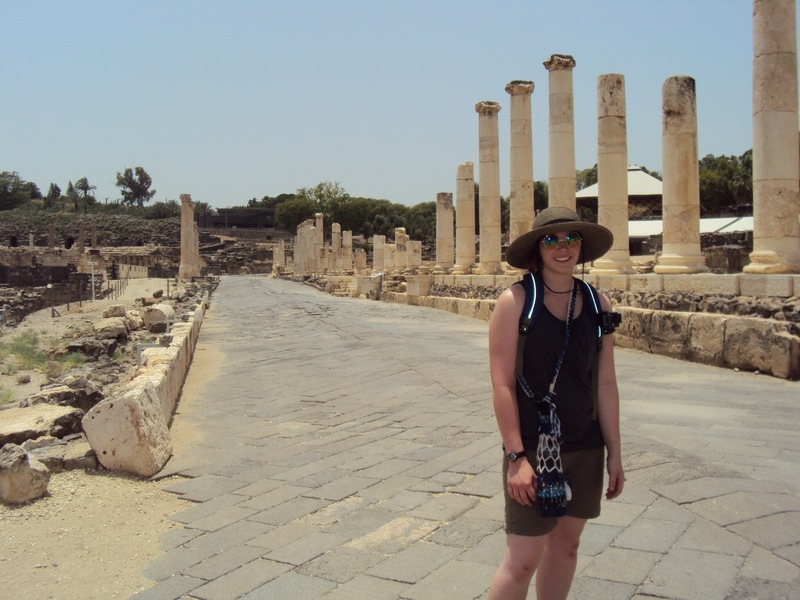 Blog Post: In the past two weeks, we’ve been able to tour other sites around Omrit, including Banias (AKA Caesaria Phillipi), Bet Sh’ean, Nimrod, Sepphoris, and Caesaria Maritima. While these sites with the exception of Nimrod, a medieval fortress, developed simultaneously with Omrit, there are marked differences in their design and content. Bet Sh’ean and Caesaria Maritima contrast especially. Metropolitan centers of the near-eastern Roman provinces, these are two massive sites organized in the style of the Roman polis – the major social and economic areas including theatres, colonnades, baths, and temples are zoned in a centralized area. This style of municipal organization was widely encouraged under Roman governance not only because it was a structure that was easy for them to govern over (power being concentrated in one regional epicenter) but also because it most easily accommodated the communal space that was defining of the Roman lifestyle. Shopping along the colonnade, attending plays or lectures in the amphitheatre, and going to the bath house for recreation, conversation, and relaxation were activities that all Romans engaged in, and as their influence spread across the Mediterranean and Asia Minor these structures became markers of Roman status – basically, to let everyone know that these were high class cities. The more ostentatious these buildings were, the more a city could boast of its economic power and ties to certain emperors. Since Bet Sh’ean and Caesaria Maritima were both Decapolis cities, and Caesaria Maritima especially was built from the ground up by Herod the Great to show off for Augustus, it follows that these cities contain all the amenities and structure of a Roman polis. Omrit, on the other hand, is not even close to being on par with the Decapolis cities. While Omrit does house a temple complex excavated in previous seasons as well as the colonnade we are currently working to fully uncover, and seems to have been a stopping point on the nearby Damascus road, it was clear from these tours that our site is unlikely to contain most of the metropolitan elements found in Bet Sh’ean or Ceasaria Maritima. Even if there was a bath house or an amphitheatre at Omrit, it would have been much smaller and less impressive and certainly not on the scale of the colosseum at Bet She’an. Even the closest site to Omrit, Banias, can at least boast the palace of Agrippa II, who renamed the area Caesaria Phillipi, in addition to the Cave of Pan and the closely associated Tomb-Temple of the Sacred Goats. While the temple at Omrit does appear to have been an impressive structure and one that would have dominated the view of the Hula Valley, there is no epigraphical or literary evidence regarding to whom the temple was dedicated, whereas inscriptions mentioning Pan and Echo clearly identify cultic ties at Banias augmented by an account of the place from Josephus. -There appears to be a Neolithic site on Tel Azazi, overlooking our current dig site, which indicates that Omrit was occupied long before the Romans got there. -The temple was built in three phases, the most drastic change between which occurred somewhere around the Herodian era. The scale of the construction of Temple I also dictates that it was expensive, and funded by somebody with pretty deep pockets. -Many olive presses and reverse decantation tanks for the production of olive oil have been found on-site. -The bulk of the pottery found at Omrit is of local Banias and Hawaritt styles. With this in mind, it seems that Omrit was a long-standing settled area with a mostly local, agrarian economy. The majority of its trading was done in or around Caesaria Phillipi, which is only a few kilometers away, and was a much more modest settlement than Caesaria. The only outlier to this theory is the presence of the temple. Sepphoris started out very similarly to Omrit, established in the fifth century BCE, and did not contain any notable buildings until the city was named the capital of the province by Herod’s son, Herod Antipas, at which point Sepphoris was re-organized as a Roman polis. No such reorganization happened around Caesaria Phillipi, despite the construction of Agrippa’s palace. So how does this affect Omrit? 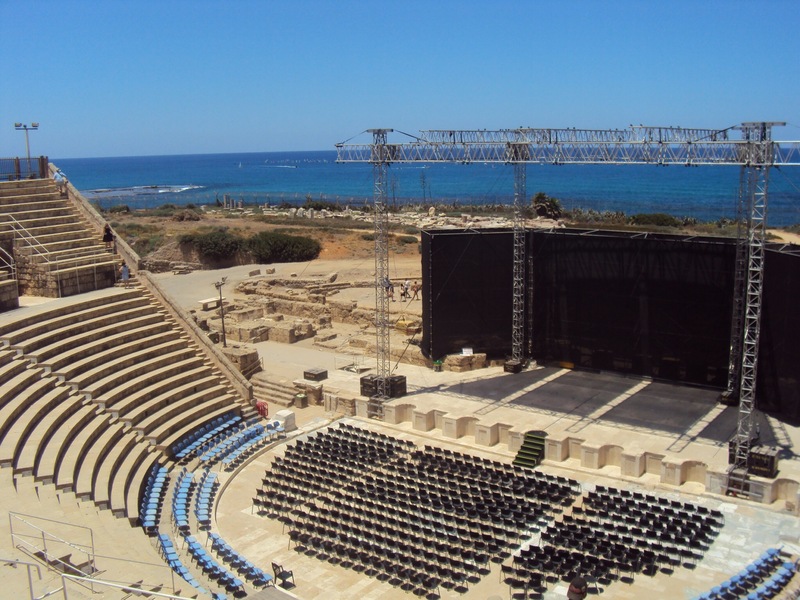 Since Caesaria Phillipi was never reconstructed as a polis, some of our directors theorize that Omrit is actually part of that city, a kind of suburb that was later integrated into the city. It would have been one of many such villages surrounding Caesaria Phillipi itself, which would have served as the major metropolitan center. This theory also helps explain the puzzle of an impressive temple being constructed in the middle of nowhere, because it integrates Omrit into a wider regional society. If this theory is right, it might even give us a clue as to whom the temple was dedicated: Josephus wrote that Herod the Great built three temples for the emperor Augustus and Roma – one at Caesaria Maritima, one the location of which is unknown, and one at Caesaria Phillipi. While there are remains of a temple at Caesaria Phillipi that archaeologist in the past speculated might have been the temple mentioned by Josephus, the layout is very awkward and restricted in size, hemmed in by the cliff and the Cave of Pan. The dating and structure of the temple at Omrit, on the other hand, seem to me to be pretty spot-on and a much better candidate. So we could be excavating around a famous Augustan temple, which is pretty cool. *The historical information in this post is from lectures by dig directors Jason Schlude, Ben Reuben, and Michael Nelson, and “Sepphoris, Capitol of the Galilee” by Zeeb Weiss.